Having the right tools is essential to being successful in the concrete construction industry. With the proper equipment, you are guaranteed to get the project done right and on time. Likewise, not having the correct tools on hand can cause unneeded delays, mistakes and end up costing you time and money overall. Since a majority of the work that concrete contractors do is by hand, the need for quality tools is imperative. Though they must be maintained regularly and operated correctly, machines are generally easier to use and compensate for human error to a better degree than handheld tools. With that, here is a list of products every concrete construction worker should always have in their toolbelt. All of these are widely considered to be indispensable by trade professionals, as they ensure that quality cuts and bends are made, all while maximizing labor efficiency. Also known as bolt croppers, this is one tool you do not want to go without. Widely used for cutting chains, bolts and padlocks, it can also be used to cut hard-to-reach rebar sections or for making precise angular slices. Bolt cutters are manufactured with various handle lengths and blade types, the most popular of which are angle, center, shear and clipper cuts. Each of these has its own unique advantage on the job, so having multiple cutters (or one featuring interchangeable blades) is highly recommended. Clippers are ideal when you need to cut against flat surfaces, while angle blades are used for making angled cuts typically between 25 and 35 degrees. Contractors have devised a number of ways to bend and mold rebar to the proper shape, but nothing works better than a good old hickey bar. 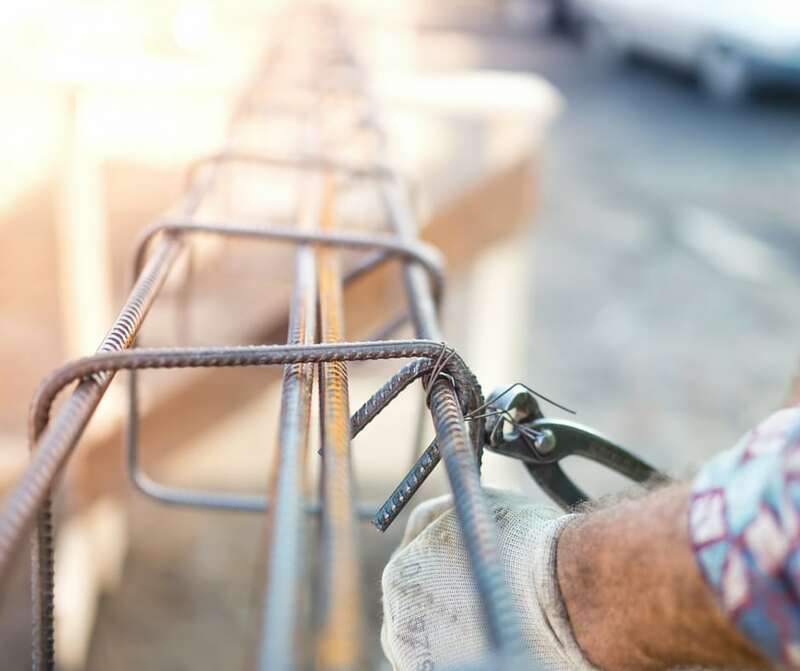 These long-handled bars (30 inches is the average length) consist of thick steel tubing that is designed to easily bend rebar up to 5/8” or 16 mm in diameter. Despite being a heavy-duty piece of equipment, hickey bars are very lightweight, making them incredibly versatile. When needing to cut rebar down to size and trim off excess length, you will need to have a reliable tool that works quickly and effectively. Using a blowtorch or saw, while feasible, requires too much time and should be considered a last resort when nothing is else is available. 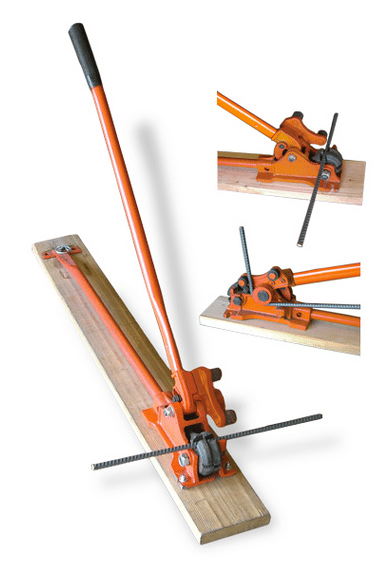 A manual cutter like the MBC-16B Manual Cutter/Bender comes equipped with a 12” slip-free handle and is mounted on a solid wood platform for maximum durability. In addition to a lift chain and ring that make for easy transport, this tool is also outfitted with interchangeable cutting jaws. Another great thing about the MBC-16B is that it doubles as a rebar bending tool. As with any construction project, concrete forms necessitate precise measurements. With a dedicated rebar bender, you can quickly bend and shape multiple sticks to the desired degree, all without breaking a sweat! The MBC-16B has an adjustable diameter bending roller that gives you complete control over the rebar. You cannot rely on your best judgment when making measurements on the job. A chalk line tool makes perfectly straight lines across long, flat surfaces, and is something concrete contractors use every day. It is a mandatory step before rebar can be laid for structural support. The string is laid out and pulled tight, causing it to snap the ground and leave behind the chalk line. Hard hats, glasses and gloves are just a few of the essential safety tools needed to keep yourself and your crew protected. Concrete construction is a hazardous profession that causes thousands of people to be injured every year.